Backup file to protect it, to make secured changes in it, or just to clone it or to move your precious file into another place! 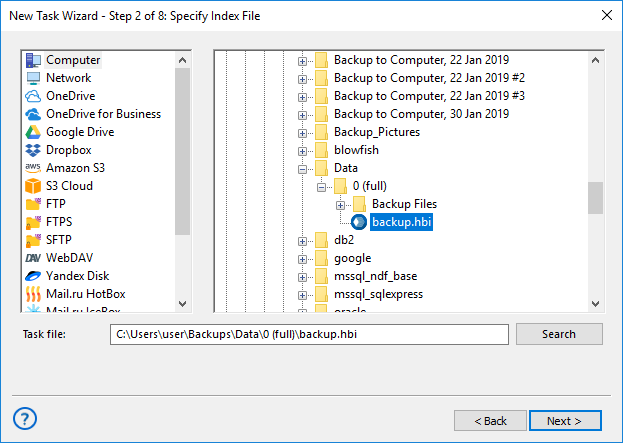 Handy Backup is an easy-to-use file backup software solution that allows you saving and restoring your files wherever you want, preserving native file formats unless other specified! You can backup file by creating an automated task, which will include all options that your need for automatic job, such as scheduling a task to a time or by an event, compressing or encrypting your files, or making partial backup for renewed data only. You will control all tasks via the comprehensible GUI. 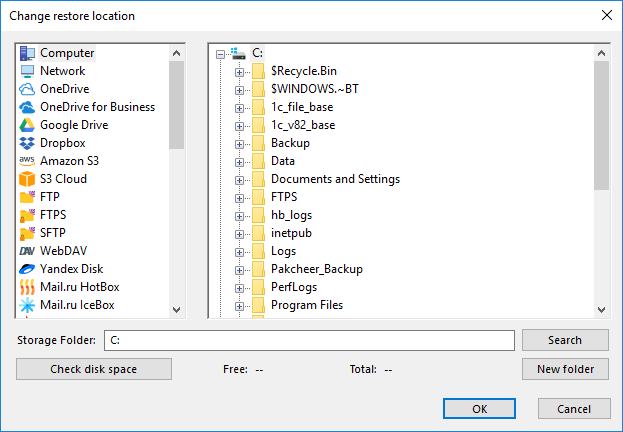 Select one of many places supported by the file backup program, from a local drive or an external USB disk to FTP or NAS storage to online backup such as OneDrive, Google Drive, Dropbox or even S3 or WebDAV-based cloud service! All data transferring protocols are secure and protected by a storage API! 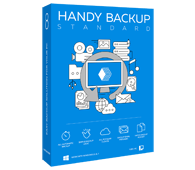 Handy Backup will work as Windows 10 file backup software, as well as supports earlier versions of Windows including Windows 8 and 7. It is also fully compatible with Windows Server 2012 and earlier editions, and can protect Linux data as well by working as native file backup software. The Standard edition provides all necessary tools and functions, making it one of most affordable and efficient file backup solutions on the market. Free 30-days trial version! 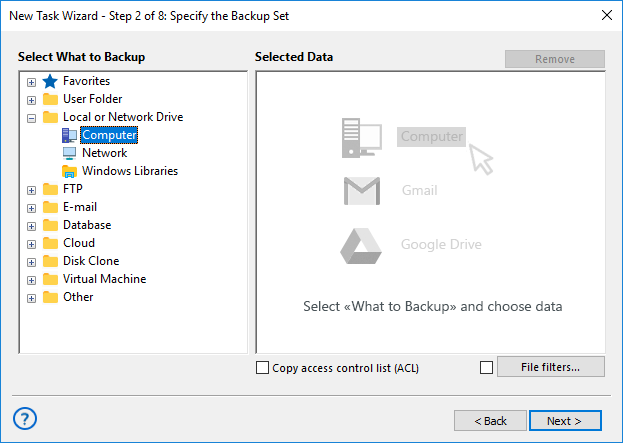 How to Use Handy Backup as File Backup Software for Windows? This short instruction will teach you how to backup file with an automatic task. In Handy Backup, create a new task by clicking a button on the main panel or by pressing Ctrl+N. Select a backup task on the Step 1. Proceed to the Step 2 by clicking "Next". On this step, expand the "Local or Network Drives" group on the left panel. Select the "Computer" plug-in. Double-click on it, or click on the ">>" button. The data selection dialog will open. Using the file system tree, find and mark your files. Click OK to return to the Step 2, and then proceed to the Step 3. Continue creating your task as explained in the User Manual. Note: You must know the location of your files specified for file backup. When you do not know where to find these files, you can use the option described below – file filters by mask and/or attributes. All file backup solutions must have a capability of automatic restore from backups. To realize this capability on Handy Backup, please create a restoration task as described below. Open New Task Wizard, and create a new restoration task as described above. On the Step 2, browse for the index file backup.hbi in your archive folder. Click Next. By default, Handy Backup will return the files it restores to the original place. In the "Select Restore Locations" dialog, select a file to move, and then click the "Change Location" button. It will open the "Change restore location" dialog. Select a new location (including a possibility for completely different destination type, such as an FTP server). Continue creating a recovery task as described in the User Manual. No of these steps have specific requirements for file restoration. Handy Backup is an example of best file backup software that you can acquire! Do not hesitate to try it by downloading a free 30-day trial edition with all functions and plug-ins just now!